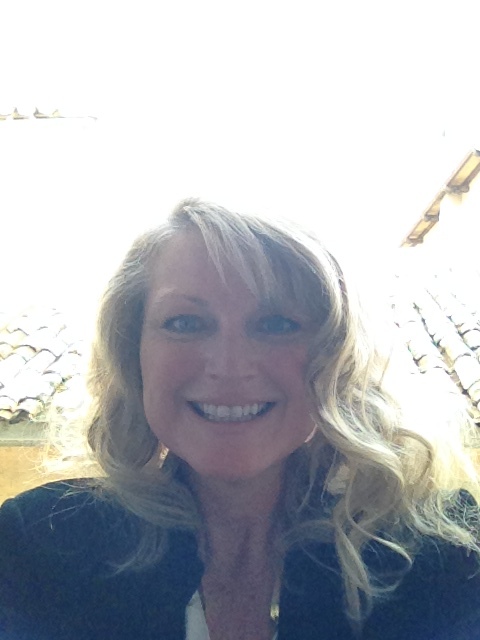 Renee at the window in Hotel Duomo, Orvieto, Italy. Sometimes you hear a phrase, a question, or a comment, and it sticks in your mind like a barnacle to the bottom of a boat — forever glued to your psyche. 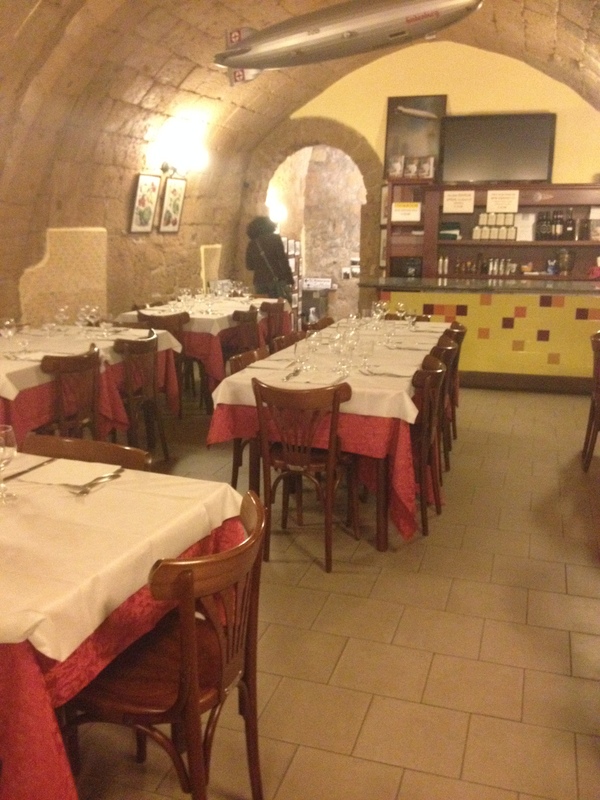 Such was the question asked of my dining companions and me during a recent trip to Orvieto, Italy. 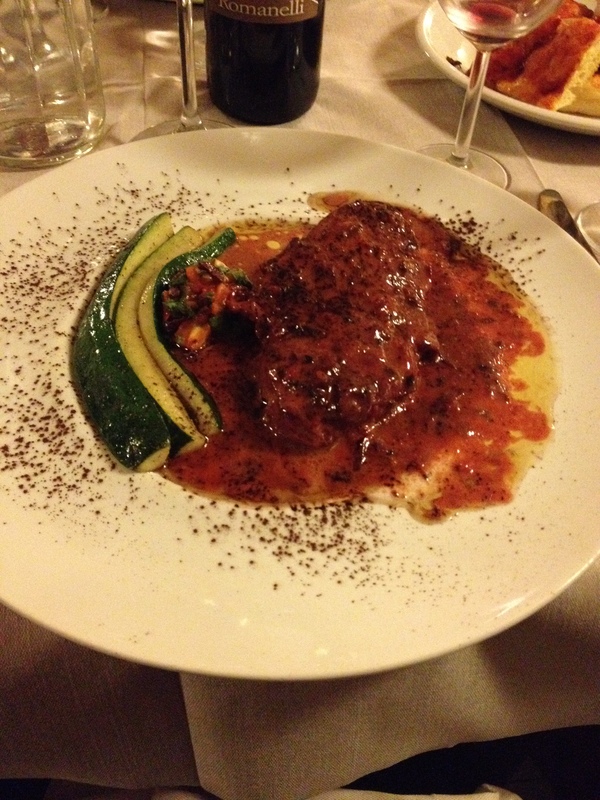 And there are few dining experiences in one’s life so spectacular as to rank among the most memorable. But when you find yourself immersed in one, you know it is special. I was in Orvieto, Italy to study the Monastic Approach to Writing under the tutelage of Justen Ahren from Martha’s Vineyard, Massachusetts. 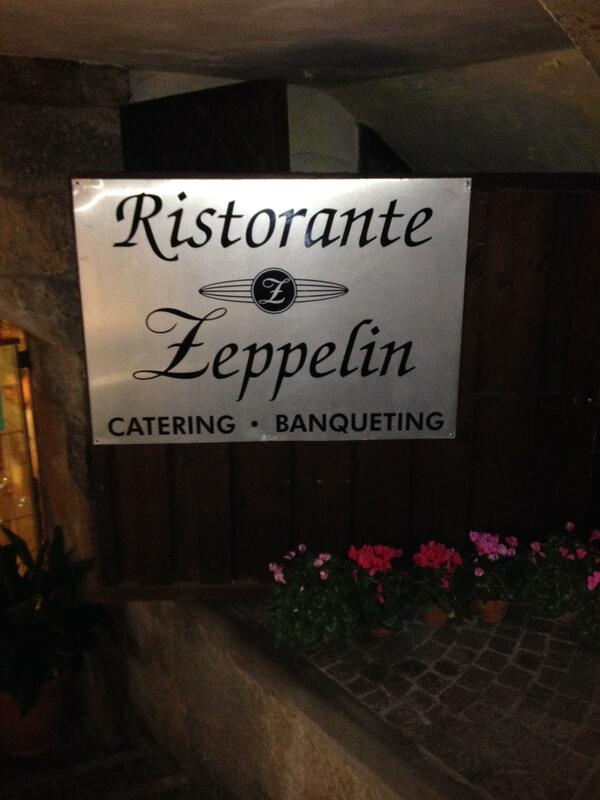 Ristorante Zeppelin had been recommended to him, thus our eagerness to give it a try. 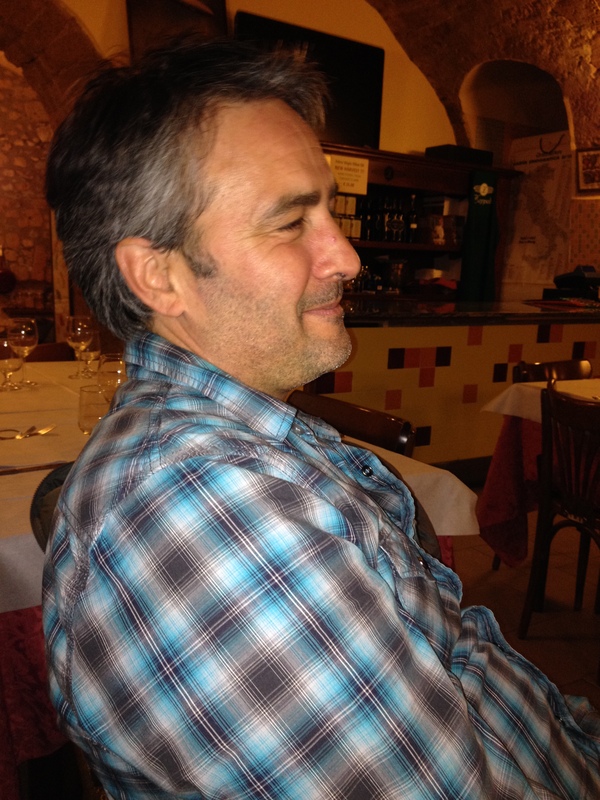 Shunning menus, Justen asked for Chef Lorenzo Polegri, a handsome Italian with a personality almost too large to fit inside of the stone walls of the restaurant. He rubbed his chin, a sparkle emanating from his eyes. This is our invitation to tell him how cooperative we are with innovative dining. Who would say normal, we asked ourselves, as we replied, “Crazy!” in unison. Clearly pleased with our answer he retreated to the annuls of the kitchen, bouncing off to the beat of the rock-and-roll music playing in the background, and the dining adventure began. I almost hesitate to call it dining. It was a full sensory romp of food, music, wine, writers, and staff — as symbiotic in relationship as that of the truffle to the tree — each giving something of value to the other. Please keep in mind as you scroll through this visual memory, this was one meal — only one — a single dinner. 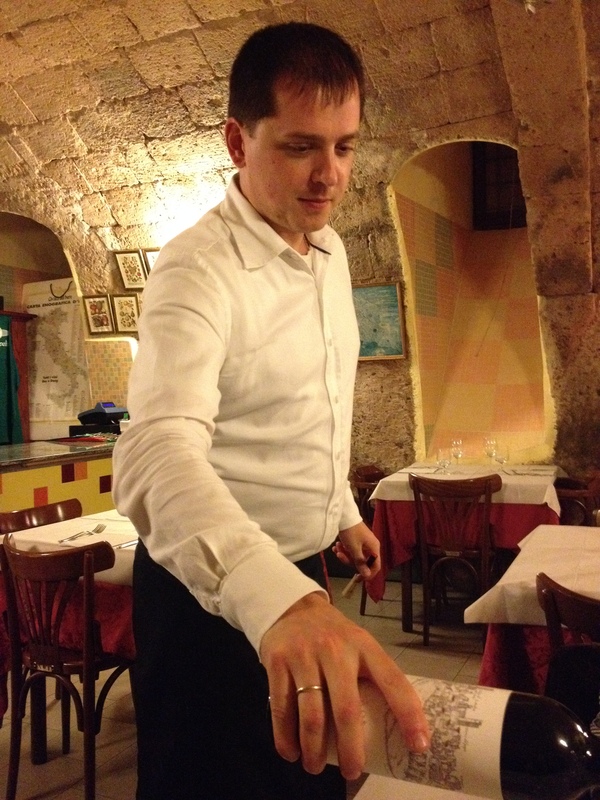 It began with wine and bread — naturally — skillfully maneuvered by our adorable waiter, Constantino. 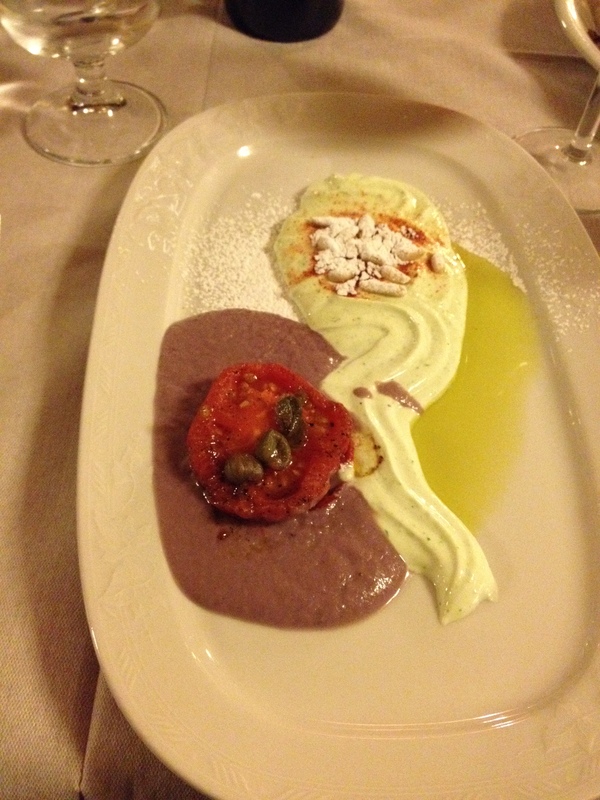 “We’ll start with dessert,” Chef Lorenzo said, and plates of puree swirls landed in front of us. Savory, with a whisper of sweet, creamy, decadent — the “mmmms” began. Next was a frittata, followed by the pasta, which had a sinfully generous mound of shaved truffles (just go ahead and hate me now) piled on the plate. I was in culinary heaven. 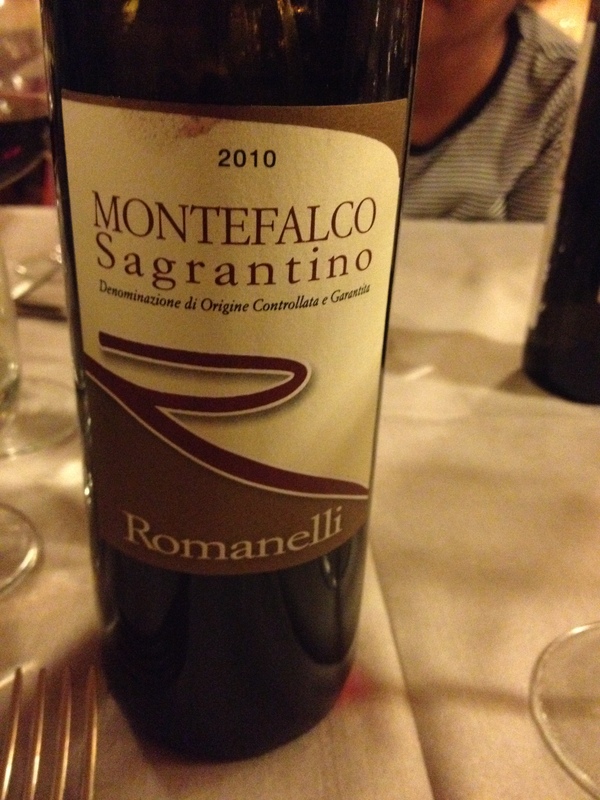 A new wine was served — my favorite — a little tannic, mouth drying, rich and full-bodied. The steak course — if one can call the tender, juicy, perfectly seared meat sitting in a sauce with notes of chocolate and cinnamon simply a steak –was next. Ribbons of zucchini bookended one side. 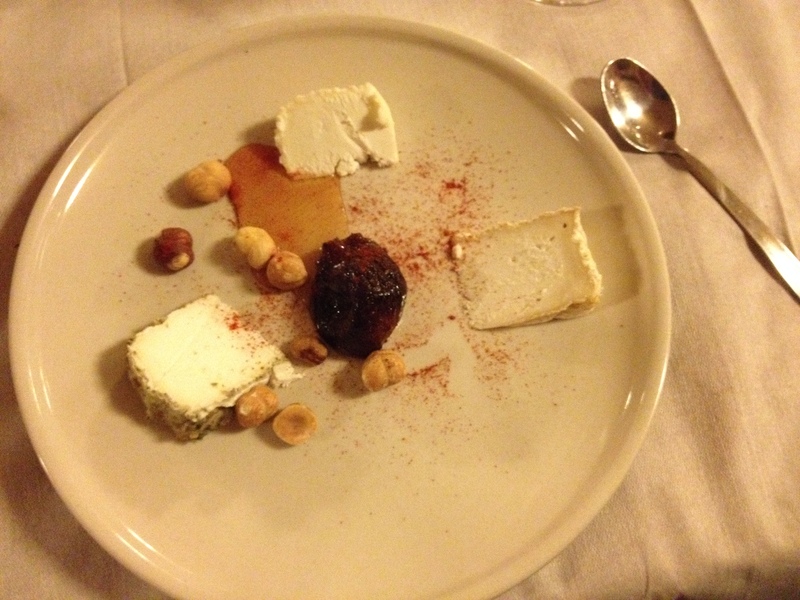 ….then cheese. And we couldn’t forget about the digestive. It was especially important after such a large meal. We applauded the staff wildly and asked them to introduce themselves. One, the furthest on the right — Sean Ragusa — was from Chicago, Illinois, and had lived for a time in North Carolina. 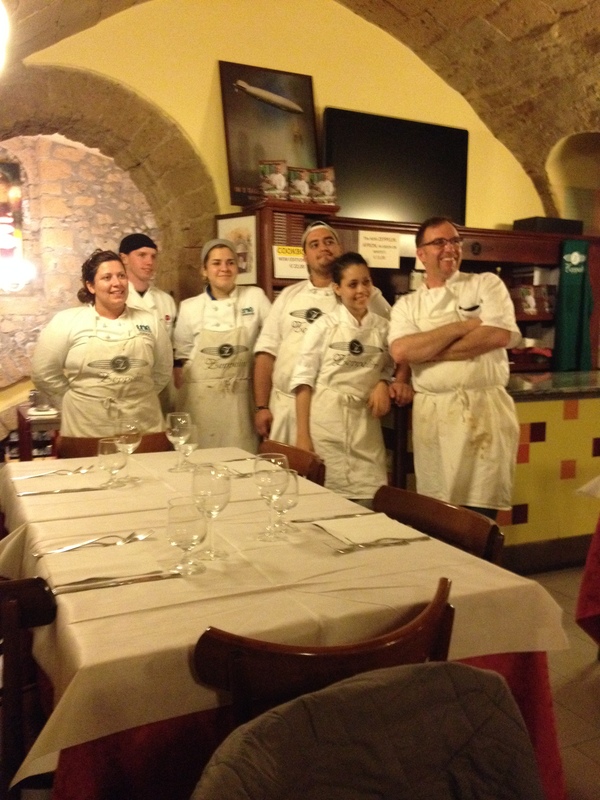 He was in Orvieto studying with Chef Lorenzo, who also offers cooking classes. 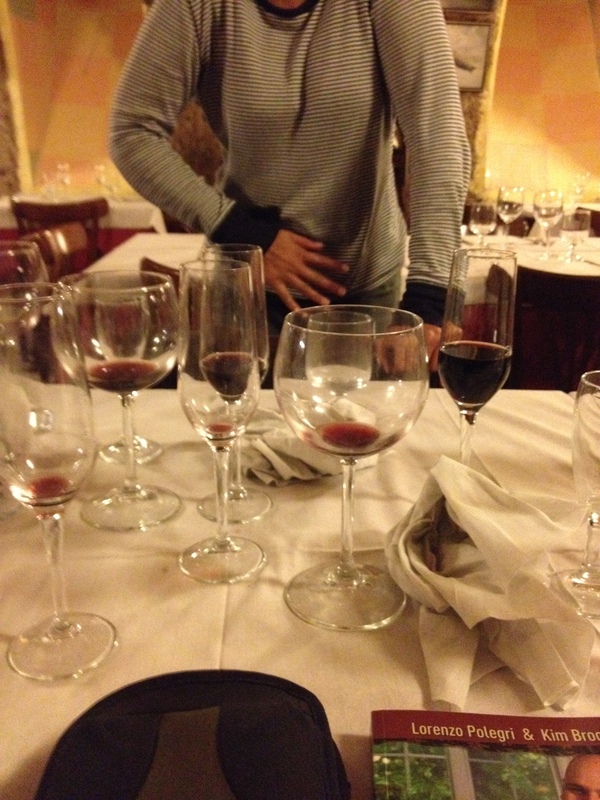 We could hardly believe the stash of empty glasses marching across the table. 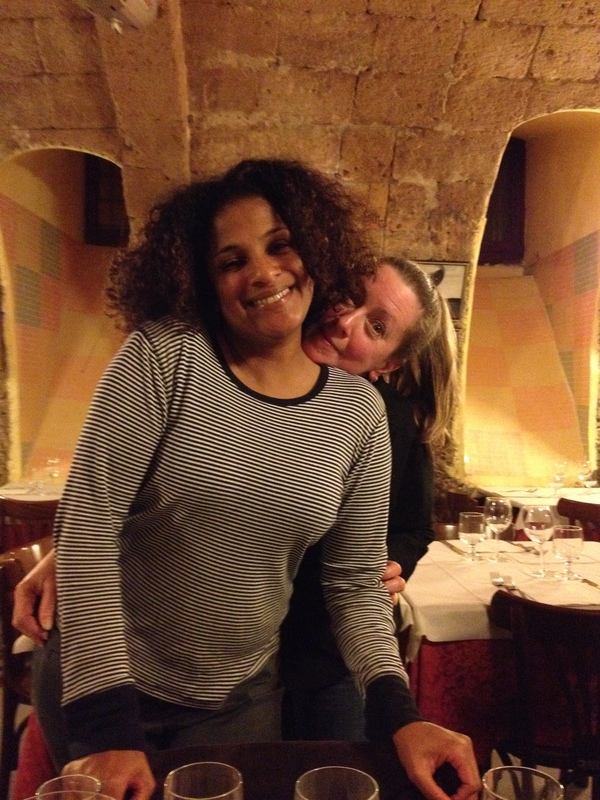 Sated and nearly delirious, I was able to convince my dinner companions to pose for a snapshot or two. 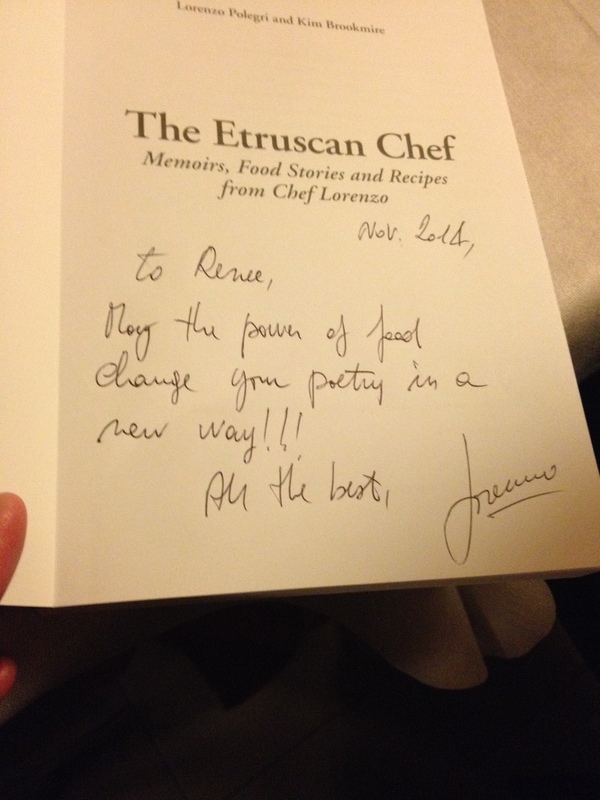 Mary and I were fascinated with Chef Lorenzo’s book, The Etruscan Chef, and he was kind enough to sign a copy for me. Wow! What an evening. 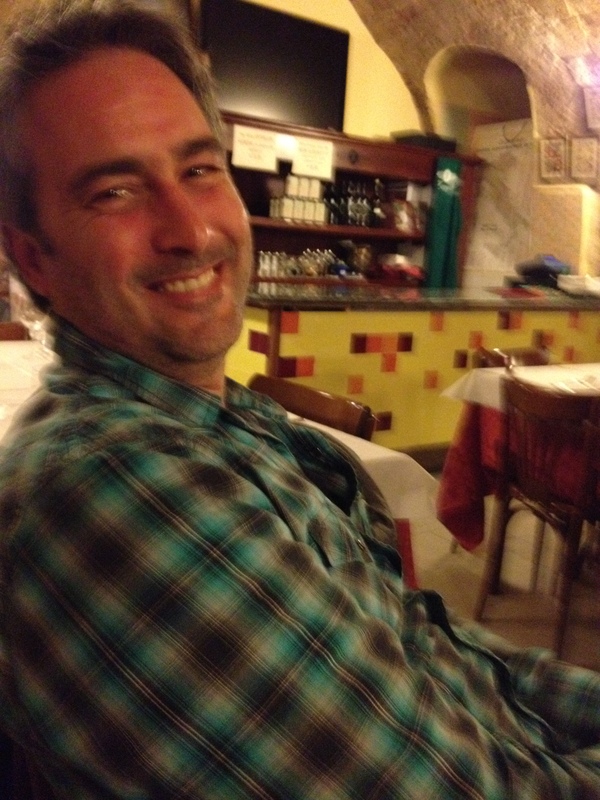 Justen’s large effusive smile says it all. 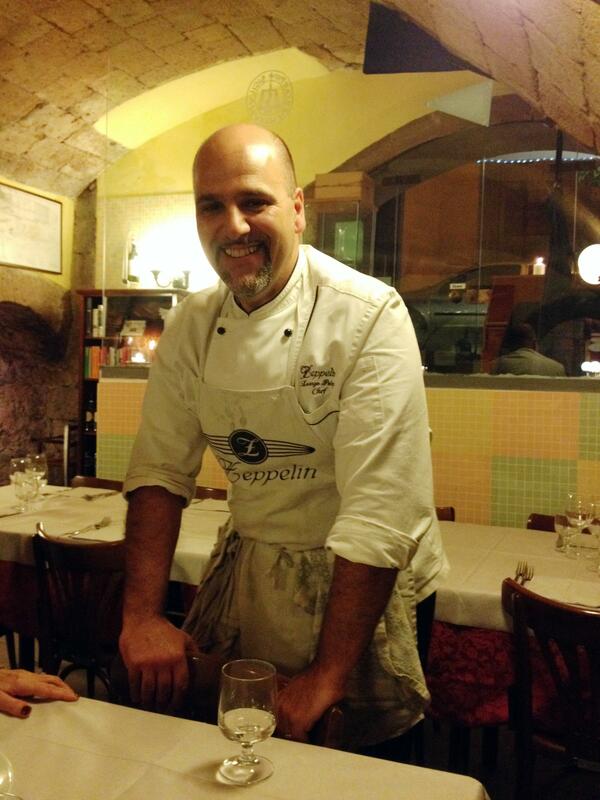 So here is my gratitude Chef Lorenzo Polegri! A full page dedicated to you and your staff. 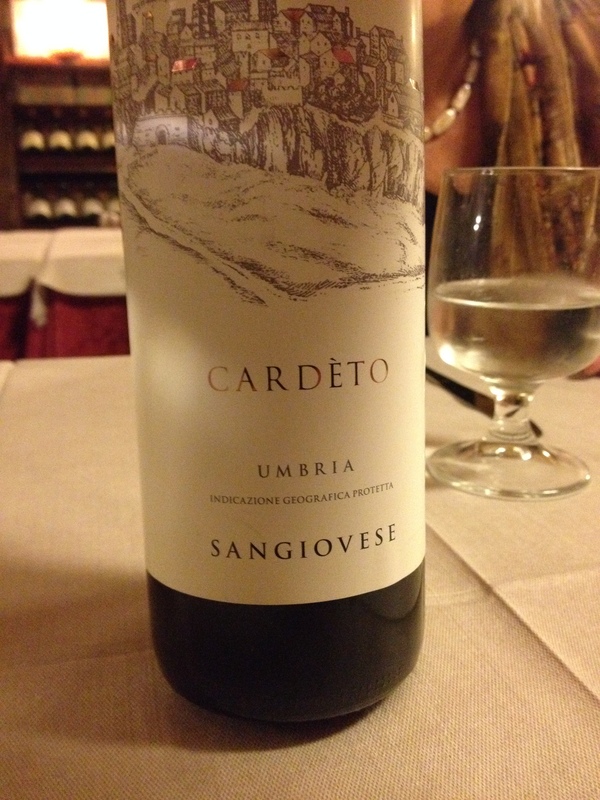 Thank you for being a lovely part of my experience in Orvieto, Italy. I’m coming back for the Truffle Hunting Excursion on your farm!! If so, this meal just turned us all into beautiful sculpture infused with color and texture from the entrees and brought alive by the heat of the wine. Your turn, dear readers. What has been your favorite meal, restaurant, or book on cooking, and why? That’s okay Yolanda. I understand perfectly, and would hate me too. I applaud you for the ‘crazy’ options too! Yay! Wonderful. I can taste those truffles …. Elyse, they were fabulous. 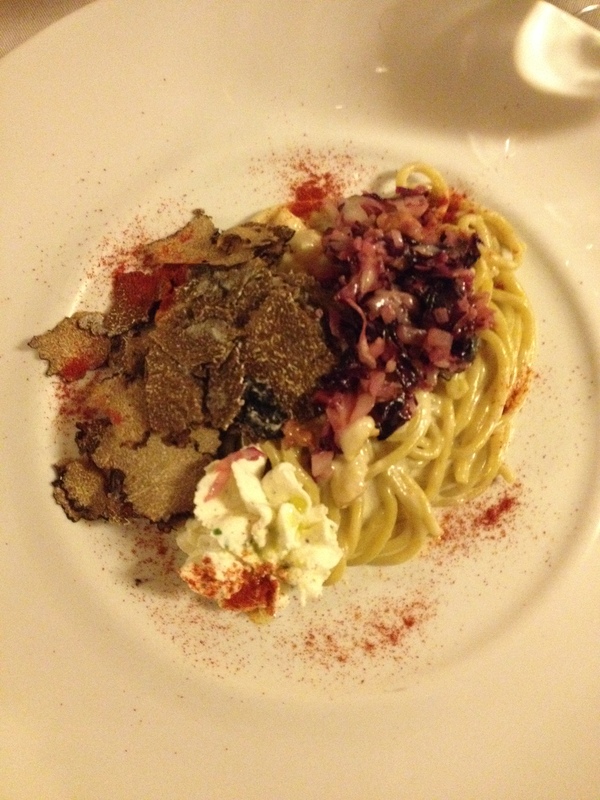 And Orvieto must have been the truffle Mecca — everywhere — even on pizza. Yum. The truffles that you had that night were fresh from a hunt that day. Wow. I’m not surprised. They were fabulous. Thank you for mentioning this, Sean. Easily one of the 5 best meals I’ve had in my life when factoring in the food, setting and company I was keeping. It was a very memorable evening. Oh Renee, I’ve so been waiting for this. Thank you so much for the blog. You certainly do have a magical way with words! It was great to meet you and so glad you all enjoyed your meal! Hi Sean! I’m so pleased to hear from you. You can tell by the comments your work is being appreciated not only by those of us fortunate enough to partake, but by the readers! It was wonderful meeting you and the entire staff of Zeppelin! A million thanks. 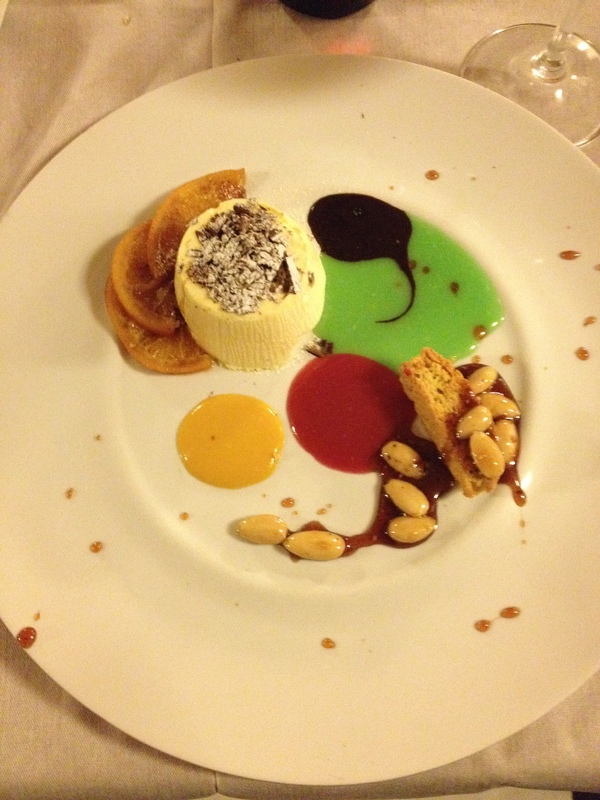 The desserts are works of art but I can do away with that and just fill the plate with 4 times as much. We eat with our eyes first, yes? So beautiful and tasty! Isn’t it? There was never a doubt as to the title of this post! Wow. This sounds like an amazing experience. That’s how I feel about a truly special meal. It has to be experienced, not just eaten. It has been a long time since I have had the opportunity to truly enjoy experiencing something like that. I live with a man who would have put ketchup on everything but the desert. Amazing for sure! There wasn’t even a salt or pepper mill on the table and you can believe we didn’t ask for them. Everything was seasoned perfectly! I can’t even imagine asking for ketchup. My guess is being tossed out of the restaurant for such blasphemy. LOL. I know! It is embarrassing and I will never forget the first time it happened. The look the server gave us is burned in my retinas. Yikes! I can only imagine…. Thanks for this delicious post Renee 🙂 The role of a Mater Chef comes out beautifully. He is perfect in both attitude and skill. It was lovely. I can’t believe you ate everything! 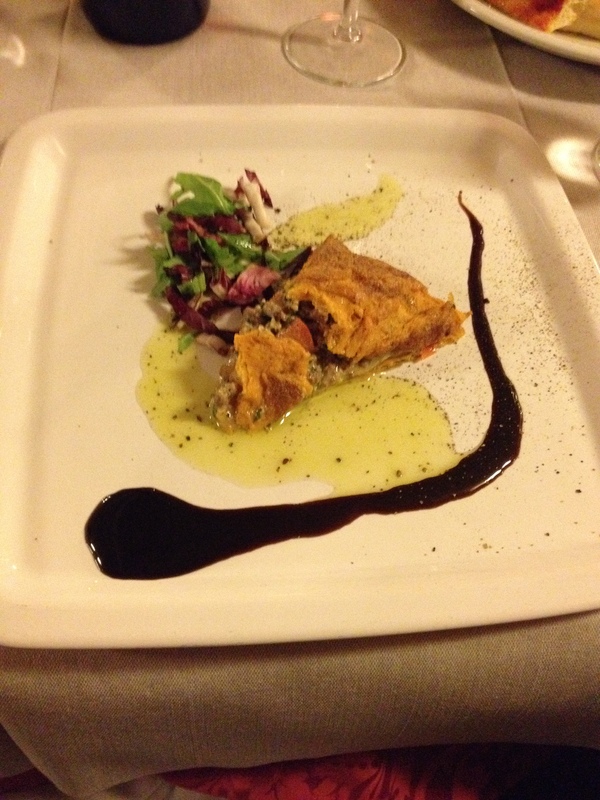 Sounds and looks delicious…what an experience! Trust me when I say I ate it all! Didn’t want to see food the next day though — still full. An experience indeed. Kim, you would have loved it. Come with us next time. In that case, you must join the next party. What a memory! I’m glad everyone went for something “Crazy!” I would too. A taste bud and visual orchestra, bringing bliss and heavenly twist to the palate. An enriching dining , cultural experience. 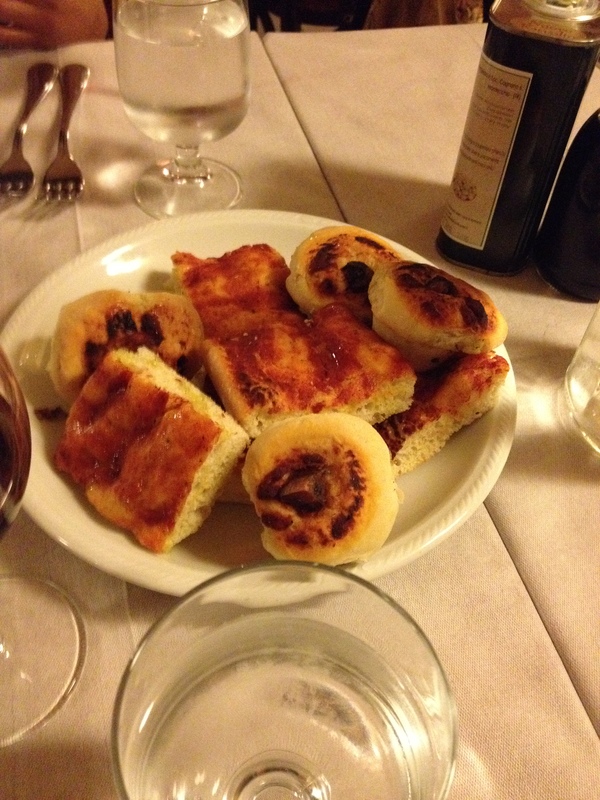 Thank you for sharing this, though I haven’t been to Italy, you made us all feel that we travelled with you! Have a blessed weekend! Thank you. As you know, nothing makes a blogger happier than feeling as if they shared an experience so vividly the readers were along for the ride. You are a master at that skill, IT. “Visual orchestra” — yes! Oh, what a meal! The flavors, the scents, the company – it will all linger in my memory forever. I’m so grateful to have had the opportunity to experience that night (and the whole trip!). Thank you for putting together such a wonderful description. Happy writing! Thank you, Kim. It was a perfect combination. I think Chef Lorenzo’s personality added a lot to the mix too. 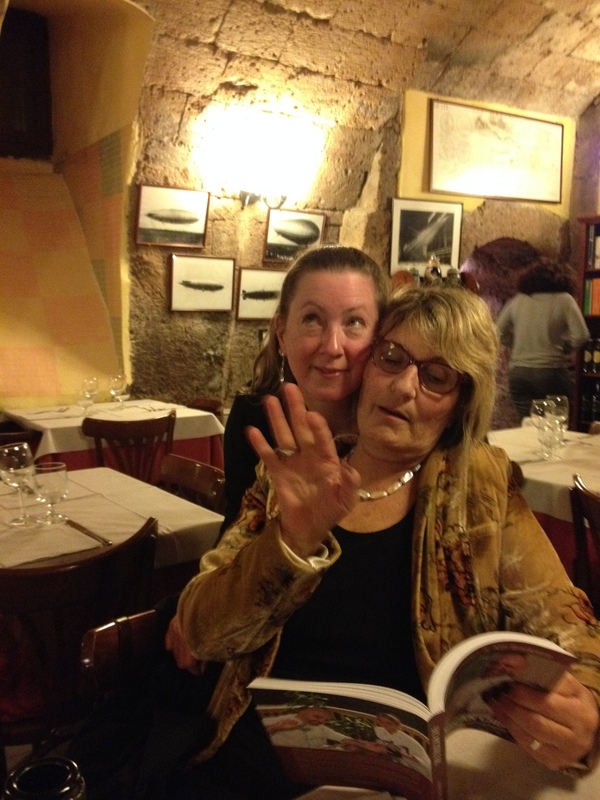 Meeting you and having the opportunity to share writing time with you was fabulous as well. Looking forward to seeing great new work from you. Wow! I feel stuff just looking at all of your photos, Renee. What a great time you had! Chef is my kind of guy. Thanks for sharing! I knew you’d enjoy this post Jill. And the Chef was a lot of fun, besides being gifted in the kitchen. Thank you for bringing us along. Wonderful photos. So crazy just might be starting with dessert and almost ending with dessert and then lemoncello. This would certainly rank in my top dining experiences. Kudos to Justin for taking the recommendation and going with it. Yes, he was (is) a wonderful leader and an inspiration. 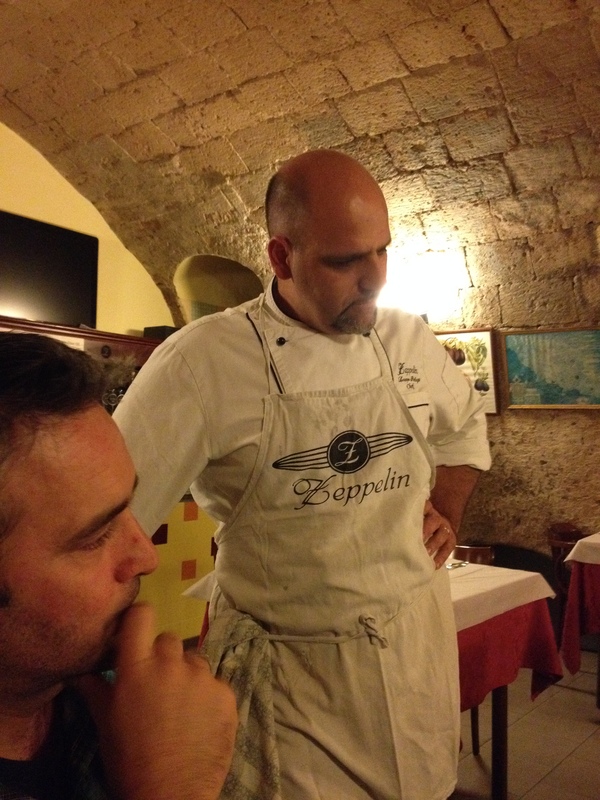 And Chef Lorenzo was clearly enjoying the interaction as well. Great evening Georgette. 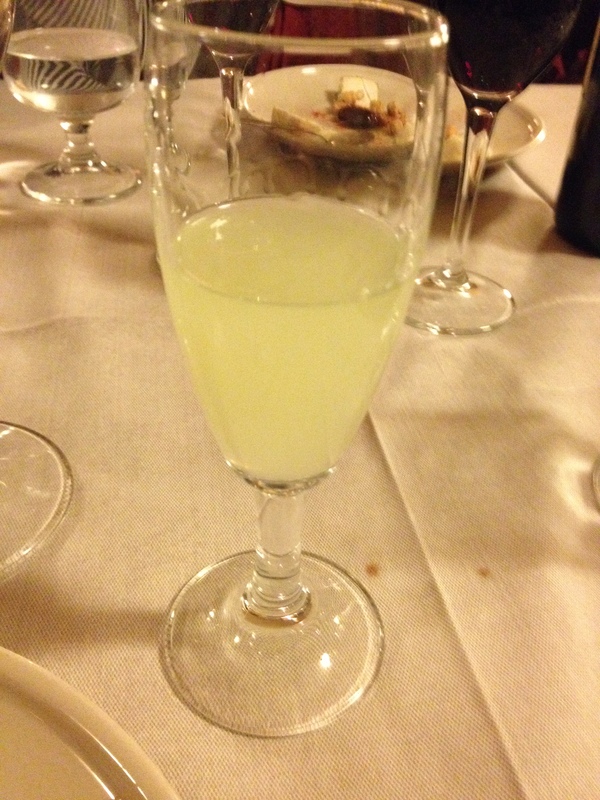 PS — Georgette, are you making lemoncello this year? Is it too late now? What a fascinating adventure for the palate. Sure wish I could’ve been there, too. Sounds like you had a blast. I can tell after reading my favorite line in this post: “It was a full sensory romp of food, music, wine, writers, and staff…” Brilliant, Renee! A theme park for the taste buds, for sure Monica. I wish you could have been along with us as well. You would be so much fun, as I can tell you share the adventurous side of life. Thanks. Thank you. The food was amazing to look at and even more amazing to consume. And after all of that food, we needed a little rocket fuel to blast digestion. Oh man, what a feast! Those Italians! And how blessed we all are to be able to bask in such a huge variety of ways to be creative! That dessert plate was the bomb! It was magnificent. I wish you had been there to partake with us. Yum! I enjoyed vicariously being part of this “crazy” dining experience. It sounds awesome. It was awesome. Chef Lorenzo had a bit of fun with us, I think. 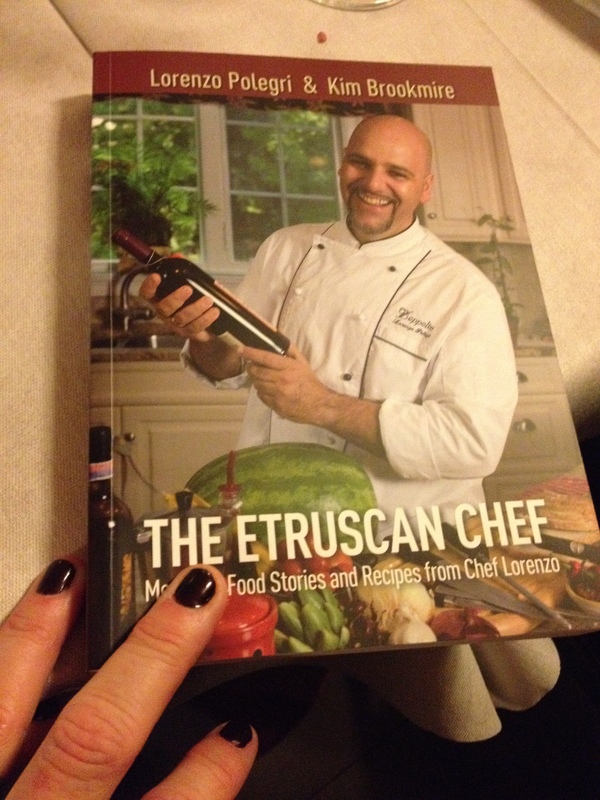 Anything Chef Lorenzo wants to start with is fine with me. Delicious! This is where I would care to spend my final day on earth. Well, maybe my last week. OK, so my last month. 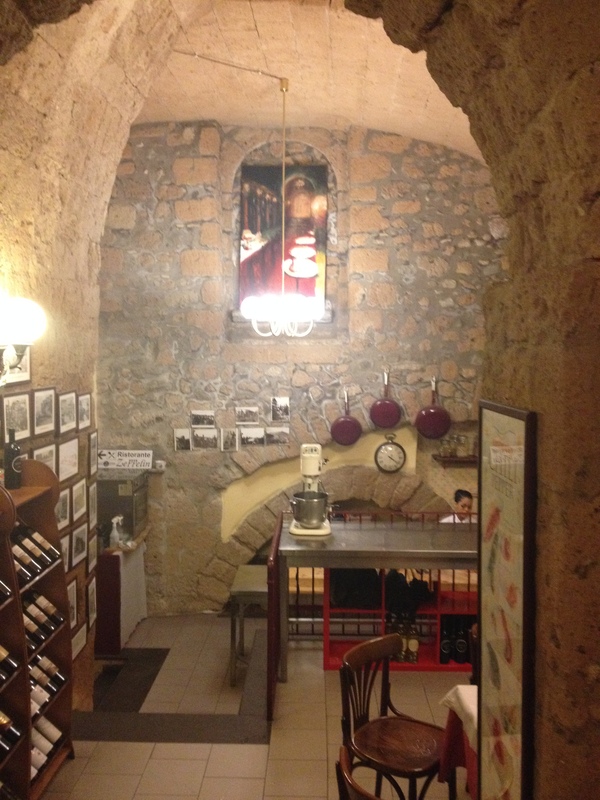 Then even better…..Hey could you get me a room in the cellar or maybe next door to this place ?